Shafath Ali Khan also said he was mulling sue Union minister Maneka Gandhi for her defamatory tweets in which she called him and her son a ‘criminal. Sharpshooter Shafath Ali Khan on Wednesday said he was mulling to sue Union minister Maneka Gandhi for allegedly levelling defamatory and wild charges against him over the killing of tigress Avni in Maharashtra last week. Khan said his son Asgar Ali and his four-member team were issued an authorisation letter by the Maharashtra forest department to carry out the operation and the tigress was shot at in “self-defence” while they were trying to tranquilise it. 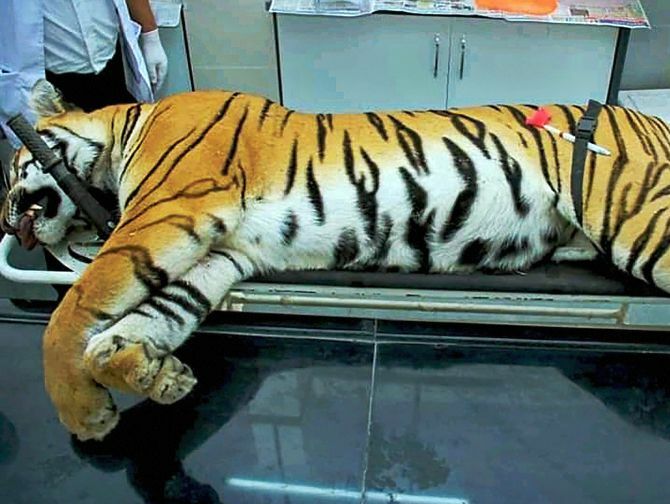 The tigress, officially known as T1, was believed to have killed 13 people in the last two years. It was killed on November 2 by Ali in Maharashtra’s Yavatmal district as part of an operation. The big cat has left behind two 10-month-old cubs. Gandhi, in a series of tweets last Sunday, had lashed out at the Maharashtra government for giving the orders to kill the tigress, despite opposition from several stakeholders. The Union women and child development minister had also slammed Maharashtra Forest Minister Sudhir Mungantiwar for hiring private marksmen Khan and his son to carry out hunting operations in the state, including the killing of Avni. However, Mungantiwar had also claimed that Khan, who Gandhi had termed a “criminal”, was tasked with shooting a tiger in her Pilibhit Lok Sabha constituency in Uttar Pradesh in 2009 (Gandhi’s son Varun Gandhi represented the constituency then). Khan said, “We are taking legal opinion on that, because she (Gandhi) has made some serious and baseless allegations personally on me and my family. He further said the order of the chief conservator of forests, Yavatmal, mentioned the name of his son and four other members of his team for carrying out the operation. Khan said on November 2, the tigress had attacked at a lightning speed the open-top vehicle, in which his son and his other team members were moving, despite being shot with the tranquiliser. “There could have been two-three deaths had she mauled someone in the vehicle and at that point of time, my son took out the barrel, pointed it towards her and shot her... there was no plan to shoot or kill her and it unfolded so fast... it was fired totally in self-defence,” he added. Khan said shooting an animal in self-defence was not an offence according to section 11(2) of the Wildlife Protection Act. According to him, even the Supreme Court was clear on the matter -- “tranquilise T1, failing which, eliminate her by shooting to prevent any further human deaths”. On his part, Ali said the team, which included forest officials, had rushed to a spot where a bazaar was going on and the tigress suddenly came out in front of their vehicle. He claimed that a forest official fired the tranquiliser, but the moment the dart was fired, the tigress attacked their vehicle and within seconds, came very close to it. “When it was about to leap on us... in that situation, in self-defence, I had to take a shot at her,” Ali said. Are India's tiger numbers inflated?